STEPWISE WEIGHT LOSS IV continued.. Weight loss plan is incomplete without exercise if one is to achieve some agility & fitness. Healthy eating can make you appear leaner but what's the point if you feel weak and have to drag yourself places! For some, the very thought of exercising brings along all the reasons for not doing it! Most common excuse being no time for workout while to others the word exercise brings visions of dumb-bells and heavy gym equipments. There is a need to change this view and think of exercise as part of your daily routine. You can actually execute some simple exercises in your office as well. Remember it all adds up! Exercises are best executed in groups. This keeps you motivated. Joining a gym, a group or pairing up with a partner is a good idea. If you are planning to go solo, than CDs, DVDs or various exercise programs videos can be helpful. 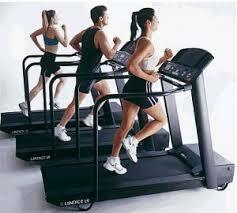 If you have gym equipments at home use them while listening to a fast number to race up your heartbeat. Remember exercise need not be just weight lifting, you could opt for yoga, aerobics or any dance style of your choice like salsa or tango. If these are still not your cuppa tea than worry not. The idea is to keep moving your body so that you burn more and more calories than you consume. Hence, if you are at home you can help with washing, sweeping, cleaning, mopping and doing the dishes! Ever thought of gardening, cleaning your car or mowing the lawn? These activities burn a lot of calories. Take up a hobby. Go swimming, play badminton, tennis or go cycling with kids. Take stairs whenever there is an option. Those TV commercials have now an added advantage, you get to do jumping jacks, crunches or burpees while your seat gets a breather! Walk as if there is a lion after you. Well, not literally but yeah I'm talking about brisk walking. Thirty minutes a day is good enough, but if you can't do it at a stretch than walk briskly every time you do. Weight lifting is a good resistance exercise that helps tone up muscles while loosing weight. If you don't have professional dumb-bells/weights try lifting your kids or moving that furniture around the house or try lifting a sack of rice. Kids are the best exercise-mates. Find time to spend with them and enjoy the games that you used to play as a kid. Hide and seek, musical chairs, kabbadi, frog race, sack race, long jumps, high jumps, racing, langdi, kho-kho/leapfrog and tug-of-war are good calorie burners. Whenever free in the office make a habit of walking around, change seats, walk about while talking on the phone, do squats in your cabin (very effective for abs), do sets of tricep dips, wall push-ups, jog in place, fist punches, standing leg curls, oblique abs fix etc. These are easy non-sweating exercises that can be done while wearing a suit! You can do breathing exercises too while at work. And here is your final step to stepwise weight loss!